You are here: Home / Blog / Make Your Deck the Safe Place for Neighborhood Fun! (ARA) – In every neighborhood, there’s always that one house where people love to congregate. Sometimes all it takes is a shady front porch that draws neighbors for a glass of iced tea — or a backyard deck that becomes the outdoor kitchen, den and dining room, where everyone enjoys hanging out. Making your home the hub for fun can be as easy as creating the space and inviting folks in. But it’s important to make sure your outdoor living spaces are as safe as they are fun. If you already have a deck, give it a thorough checkup. See if you have any loose railings or balusters, and inspect the foundation of your deck for rotting wood, corroded or loose fasteners and any mold and mildew. 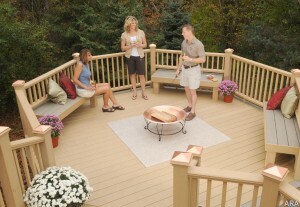 If you find that your deck needs repairs, consider updating it with new composite decking and railing. Latitudes, a leading composite decking brand, offers several unique decking and railing combinations, each offering superior strength and resistance against the rotting, fading and warping that typically occur with wood due to varying weather cycles. 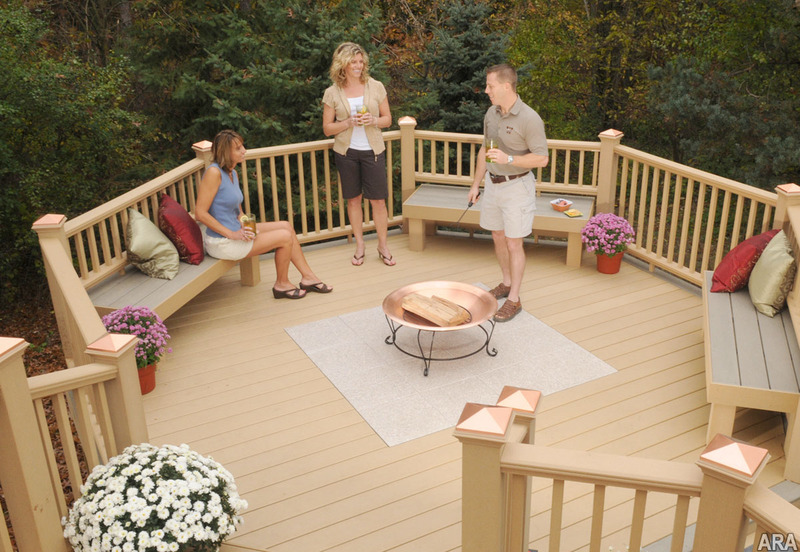 Low-maintenance composite decking never requires staining or sanding, and is available in several natural-looking colors. Latitudes Capricorn decking even offers the rich look of tropical hardwood. From a safety standpoint, all the deck surfaces are slip-resistant and splinter-free — definitely a consideration when you’re designing a space to entertain. Dane Jackman of Jackman Construction is a green building expert in South Florida who is a big proponent of outdoor living spaces as the focal point of a home. The homes he builds feature interior courtyards and rooftop terraces, and when he plans a deck for his homes, he works with the homeowners to determine exactly how they are going to use it. “When you are creating a deck, be sure to plan space for an outdoor kitchen or barbecue area, areas for relaxing and keeping an eye on the kids, and a place for al fresco dining and outdoor entertainment,” Jackman says. In the outdoor kitchen “area,” consider installing deck stones. Use these self-draining, real stone tiles to create a fire and grease barrier under your grill. You can also use these stones as the base for a raised fire pit on the deck, which will make it a favorite hangout for teens and late-night marshmallow roasting. When safety is paramount, be sure to plan for lighting. There are many new products that provide direct or ambient lighting to help make your deck and outdoor living area safer for you and your guests, even late into the night. 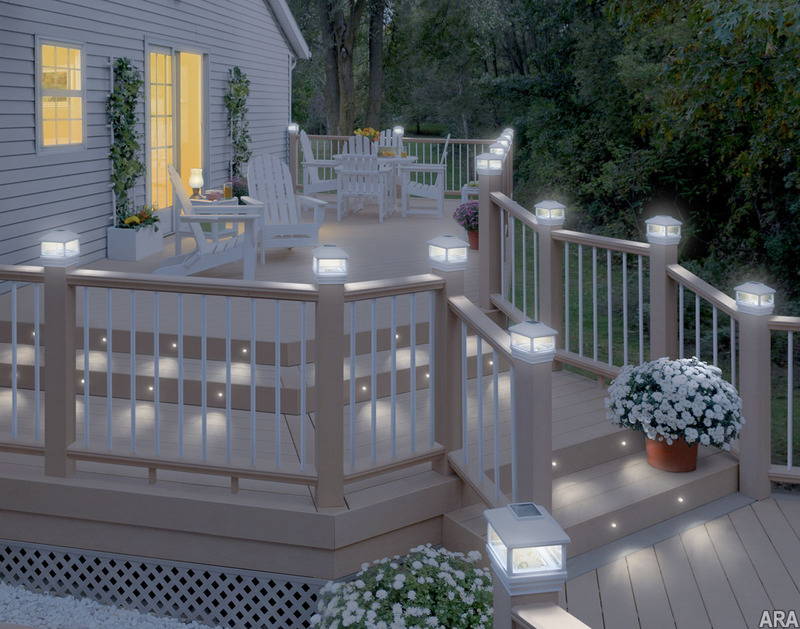 Deckorators offers low-voltage, LED recessed deck lights, which can be set to turn on automatically at dusk, adding a measure of security to your home. Eco-friendly solar-powered post cap lights come in styles ranging from the basic to the dramatic. The new Dynasty Copper Post Cap Light offers Asian flair in a Craftsman-inspired copper and gunmetal that offers illumination and high style. 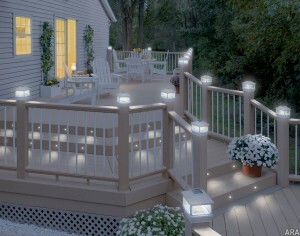 Post cap lights are designed to fit on virtually any railing post on your deck. And with solar caps, no wiring is required. If your existing deck simply needs to be refreshed – or needs sturdier rails to make it safe – the easiest way to update is with new balusters or rails. Some manufacturers sell railing systems in kits that include rails, post sleeves and post caps. It’s a relatively easy, do-it-yourself way to put a whole new face on a tired-looking deck. This spring and summer, consider spending some of your home improvement dollars on the safety of your deck and the outdoor living areas of your home. These entertainment spots not only beckon to friends and neighbors, but add value to your home.